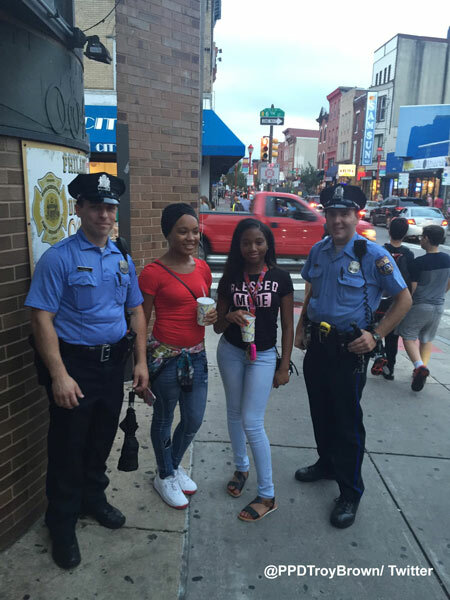 Philadelphia Police Officer Troy Brown of the 12th District said these two girls wanted to take a picture with him to show their friends that not all police officers are bad. PHILADELPHIA (WPVI) -- There is an old saying 'a picture is worth a thousand words' and in this day of social media, a picture can mean a whole lot. With the tragic events in Louisiana, Minnesota, and Dallas, the role and responsibility of law enforcement in their community has been on the minds of many around the country. In recent days, police officers in and around the Philadelphia area have posted images to show the part they play and how they are a part of the neighborhoods they serve. 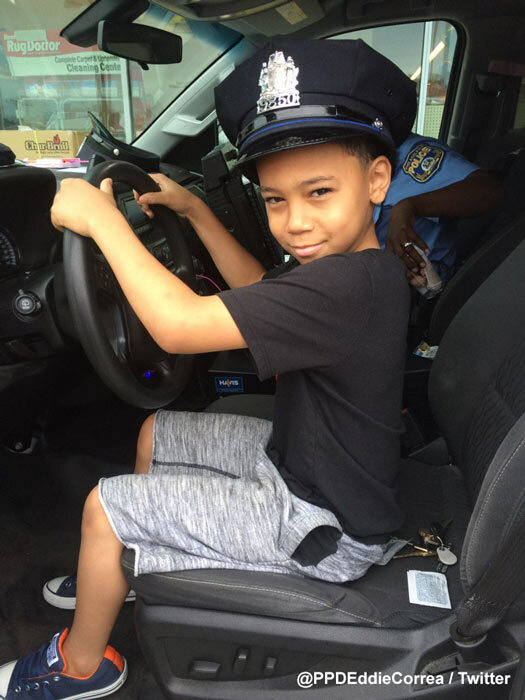 Philadelphia Police Officer Eddie Correa took this photo of young Jaden. Officer Correa tells Action News he was at the Schdmidt's Commons, formerly the Piazza at Schmidts, at 2nd and Girard on Saturday when Jaden's grandmother came up to him. The grandmother told Officer Correa she wanted Jaden to meet a police officer. Philadelphia Police Officer Troy Brown was patrolling South Street Saturday night with Officer Fitzgerald when two girls came up to him in front of the firehouse. "They just came up to us and said, 'Hey can we take a picture with you? 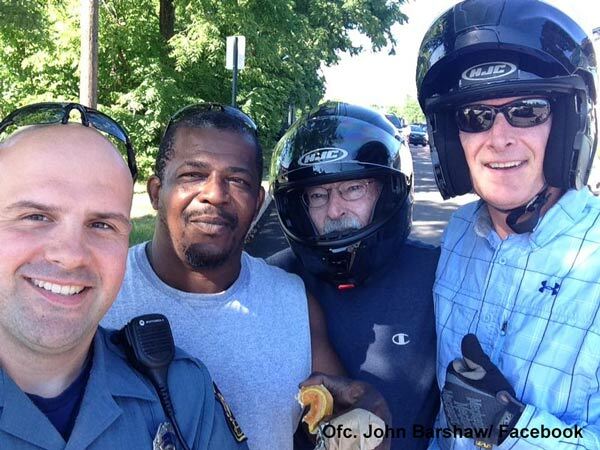 We just want to show our friends that not all police officers are bad,'" Brown tweeted. Officer Brown said they took the picture. The officers then saw the two girls a few times later in the night when Officer Brown says they were greeted with a "Hey friends." This picture, provided by Officer Brown, was taken by Philadelphia Police Officer Jamaar Leary. Officer Leary and Officer Fitzpatrick were on a break and tell Action News they "felt the picture was appropriate." 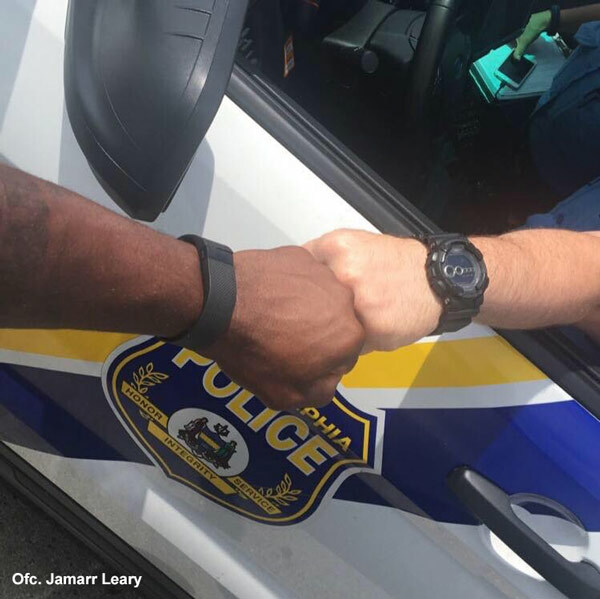 This picture was taken by Philadelphia Police Officer Jamaar Leary. Officers Leary and Officer Fitzpatrick "felt the picture was appropriate" in the wake of recent events. 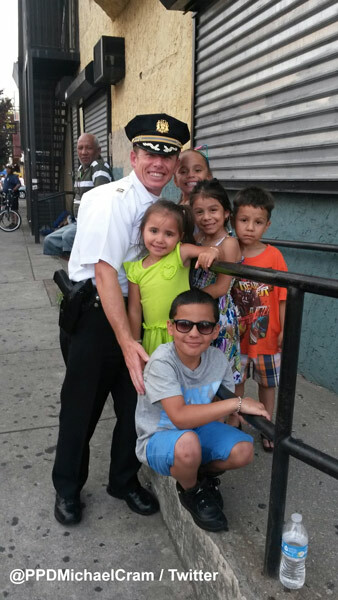 While protecting protesters during a demonstration last Friday, Philadelphia Police Captain Michael Cram of the 25th district spotted a few of the neighborhood kids who he has come to know. Cram, a captain in the district since 2014, said he was proud of the support shown by the community for the officers. He tells Action News the kids invited him to an upcoming block party that will feature ballerinas. Early Sunday morning in Montgomery County, Collegeville Police Officer John Barnshaw was patrolling the area near the Collegeville Diner. He saw an 84-year-old man and a friend leave the diner on motorcycles. "As the male stopped prior to turning onto East Main Street he lost his balance causing him to fall off his motorcycle and the bike on its side," Officer Barnshaw wrote on his Facebook page. That's when a Good Samaritan who was walking in the area along with Officer Barnshaw rushed over to check on the man. They were able to get the man up and it looked like only the motorcycle got a few scrapes. "The Good Samaritan jokingly said, 'They say we can't work together!' All four of us laughed, shook hands and went on our separate ways after a quick photo," Barnshaw wrote. Along with these photos from officers, civilians Andre Fooks, Nigel Newman, and Aaron Grant of Sicklerville, New Jersey started the trend #PicsForPeace. They posted a photo with Winslow Township Police Chief George Smith wanting to spread unity for all races and cultures. 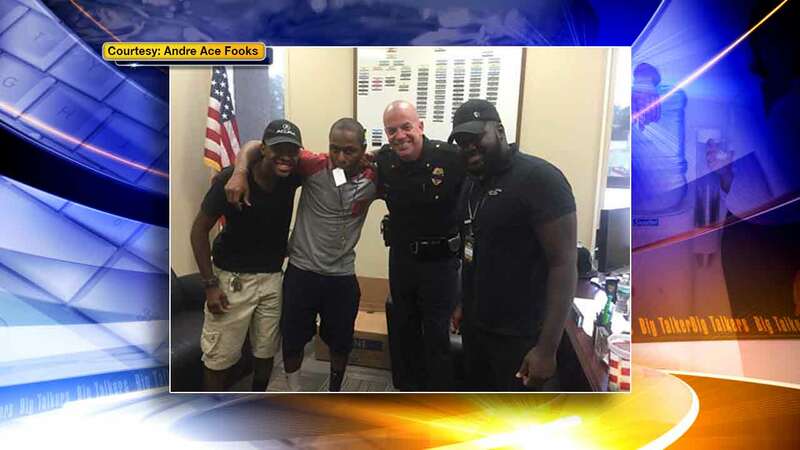 Fooks posted the picture from their meeting with Chief Smith on Facebook, writing in part: "Not every black person is a thug, not every white person is racist and not every police officer is dirty. It is a simple fact that sometimes people do really bad things for no good reason."